Through the first three games of the postseason, the Tigers’ offense looked defeated against the AL West champion Oakland Athletics. But, for one game, it all seemed to change. Jhonny Peralta was the answer Tuesday night for Detroit. After singles by Prince Fielder and Victor Martinez to start the fifth inning, Peralta blasted a three-run shot into the left field stands to tie the game at 3-3. He finished the night 2-for-3 with three RBIs as the Tigers came back to beat the visiting Athletics, 8-6. 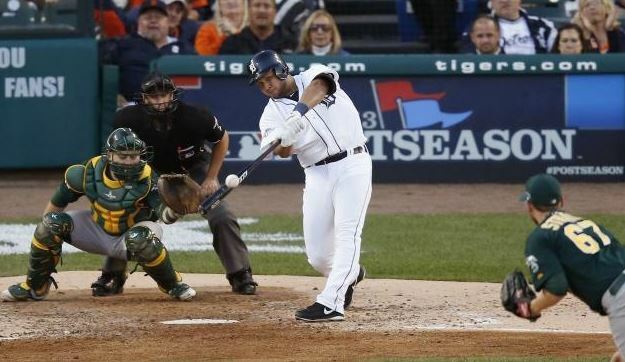 The A’s out-hit the Tigers 12 to nine, and opened Game 4 as if they wanted to end the series Tuesday at Comerica Park. Coco Crisp led off the first inning against Tigers’ starter Doug Fister with a triple, and scored two batters later on a Jed Lowrie single to right. Oakland struck again in the fifth, when Crisp singled to lead off the inning and Lowrie homered to right to give the A’s a 3-0 lead. After Detroit went 1-2-3 against Oakland starter Dan Straily in each of the first four innings, Peralta’s home-run tied the game at 3-3. Game 1 starter Max Scherzer relieved Fister to start the seventh, and surrendered a run when Crisp singled to score Stephen Vogt with one out. Trailing 4-3, the Tigers responded in the bottom of the seventh when Victor Martinez hit a disputed lead-off home run to right field off Sean Doolittle. Replay showed a fan attempting to catch the ball over the outstretched glove of Josh Reddick as the Athletics’ right fielder jumped near the fence. After viewing the replay, home plate umpire Jim Reynolds confirmed the ruling of a home run, tying the game at 4-4. Peralta, the next batter, doubled, and Andy Dirks entered to pinch run. Jose Iglesias walked to put runners on first and second, and Austin Jackson singled to score Dirks. In perhaps the most dramatic half inning of the series, Scherzer walked Brandon Moss to start the eighth, and Yoenis Cespedes doubled to right field. Seth Smith was intentionally walked to load the bases with no outs, and the A’s, trailing 5-4, looked primed to retake the lead. With a full count, Reddick struck out on an inside pitch from Scherzer that would have walked in the tying run. The next batter, Stephen Vogt, also went down on strikes. Pinch hitting for Eric Sogard, Alberto Callaspo hit a line drive to center field that was caught by Austin Jackson for the third out. The Tigers struck again in the bottom of the inning, when Martinez singled, and both Dirks and Alex Avila walked to load the bases. Hernan Perez pinch ran for Martinez, and scored on a wild pitch from Oakland reliever Bryan Anderson to put the Tigers ahead 6-4. With runners on second and third, Omar Infante doubled to left field, scoring both Dirks and Alex Avila. Joaquin Benoit relieved Scherzer in the ninth inning, surrendering two earned runs when both Crisp and Lowrie scored on a single by Yoenis Cespedes. The ALDS will conclude in Oakland on Thursday, starting at 8:07 PM. Leyland confirmed that Justin Verlander will start for the Tigers, while Oakland manager Bob Melvin said he has not yet decided on who will start for the A’s. Melvin has ace Bartolo Colon and rookie Sonny Gray available on normal rest.